Designed to hold everything you need when it's beer o'clock and too nice to be indoors. Grassy glades are perfect for picnicking, but definitely not ideal for keeping beer bottles or cans upright. 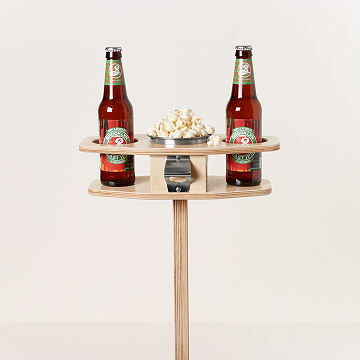 Michael and Ania Shepler's clever table is designed to hold everything you need when it"s beer o"clock and just too beautiful to be indoors: Holders for two cans, bottles, or glasses, a bowl for beer pairings, and a built-in bottle opener so you never have to do the picnic table pound. Plant the fiberglass spike securely in grass or sand, then remove the leg to easily tote and stow. Handmade from Baltic birch plywood in Mechanicsburg, Pennsylvania. Find easy setup instructions here. Michael and Ania Shepler dream of living a truly balanced lifestyle, where family, health, happiness, and social responsibility have equal footing. Lifestyle and family are the most inspirational influences on the products they design. Ania is the marketing guru of the couple, while Michael works on perfecting their designs and production methods. They stay focused on items that are functional, high quality, affordable, and made in the US. Wipe clean with a damp cloth. Wipe dry and store indoors. perfect gift for my son-in-law. My son-in-law is a Michigan State Trooper wholoves having a few beers in the back yard with friends on summer evenings. Much better, and safer, than setting your bottle or can on the ground while you take your turn at ladderball. Dad loved it; all his friends want one! He has already carved his name and phone number into it so his buddies don't try to steal it. This product is sturdy, convenient, and unique! So much fun to enjoy the outdoor bbqs, bag games, concerts and picnics with a great place to hold beer and snacks! Great for anyone who entertains or enjoys spending time outdoors! Gift that they will remember!